We all hear of how man has been to the Moon and how spacecraft have flown to explore the other planets and to study the Sun. But do you think man will ever visit the stars? If you do you, may have to think again. The stars are so far away that if we would spend an entire lifetime of 100 years traveling at 1 million miles per hour, it would only get us one-twenty seventh of the way to the nearest star! There’s not much we can do in trying to comprehend the vast distances across space, but if we shrink everything down to a more manageable size it helps us to better realize the tremendous distances between the Earth and the stars. We’ll start by making everything in the universe 10 Billion times smaller. Now the Earth is down to the size of a pinhead, about .05 inches across, or less than 1/16 of an inch. At this scale, the Moon would be less than 1/64” in size and would be 1.5 inches away. The Sun, being much farther away would be about 49 feet in the distance and would be about 5 1/2” in diameter. The planet Jupiter would be 255 feet away from the Earth and Pluto would lie at almost 2,000 feet. Now we are ready to go to the nearest star, this is where we take the big jump. Proxima Centauri, the star nearest to us, would be 2,470 miles away, about the distance across the United States. Our Sun is located in the Milky Way galaxy about 2/3 of the way out from the center. In our analogy we would be 15.8 million miles away from the center. The entire galaxy would stretch across 58.8 million miles of space. Next we’ll move out to the Andromeda galaxy, the nearest major galaxy to the Earth. It would lie at 1.5 billion miles, or 16 times the distance from the Earth to the Sun. Astronomers say there are hundreds of millions and even billions of galaxies spread through the universe. The most distant ones being found are said to be so far away that in our scale, they would be 8 trillion, 53 billion, and 551 million miles away, this is about 1.4 lightyears! 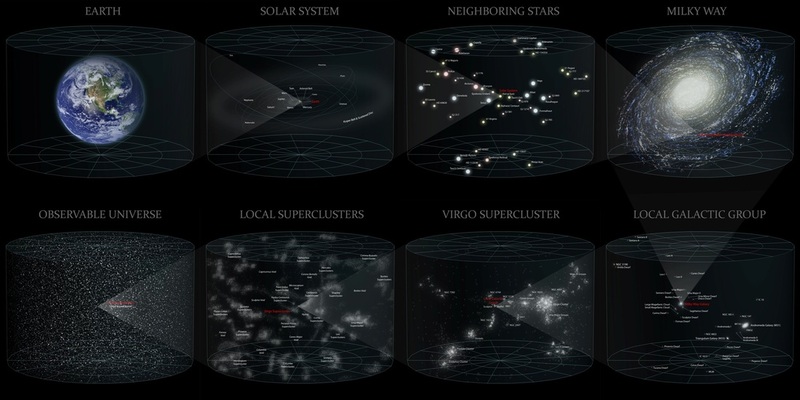 We are faced with such an unimaginable distance even after we shrink the universe by a factor of 10 billion. To put the number 8 trillion into proper perspective let’s imagine making a stack of that many one dollar bills. One bill is about .1 mm thick so it would take over 3,000 to make a stack one foot high. To reach a mile high, we would need over 16 million bills. But we could make it all the way to the Moon with a little over 3.8 trillion bills. So with 8 trillion of them, we could cover the distance of over 238,000 miles to the Moon, then come back to Earth and still have some to spare. We are confounded by such an enormous universe but Isaiah wrote that God can measure the universe with the width of His hand!